To maximize the time, it will be an early morning flight. After a few Makati Manhattans and those delicious crispy rock prawns from the Long Bar of Raffles Hotel in Makati (we apparently make stronger drinks here than the original Long Bar in Singapore), there really wasn’t much time to take a quick nap. It was almost straight off to the airport. Surprisingly, Ninoy Aquino Terminal 3 is buzzing at 3am. This place is queue central: Queue for travel tax, queue for check-in, queue for terminal fee, queue for immigration, queue for screening. To be fair, even other airports have some of this queue. 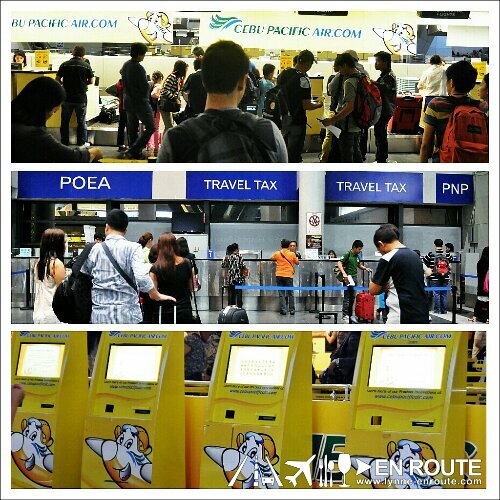 Something new for domestic travelers, though: test units of self-check-in kiosks of Cebu Pacific. Should give this a try one of these days. I’m just really tagging along for this trip. The last time I went to Singapore was back in 2007. Like what Ray mentioned, we will be looking for the soul of the Lion City. Something I found lacking from my 2 previous encounters with it. It wasn’t in the Royce chocolates (we didn’t have this in Manila back then and we’d bring it home with an ice pack), not in Sentosa, not even with the giant rats of the night safari. I can’t believe a city’s soul just goes missing. Speaking of missing, we seriously lack sleep. And a few more chairs in the pre-departure area. But no matter, Ray slept on the floor and I propped myself up against the glass wall. We’re good. I’m pretty sure I’ll fall asleep as soon as we board anyway, long before the plane even leaves the ground.